United Nations Population Fund (UNFPA) on Wednesday donated mobile medical facilities worth N201,500,000 to the Internally Displaced People in the Northeast. The UN leading agency through its Programme Coordinator and Head of Office, Mariame Daboe said the donation of the healthcare facilities was to address the post-insurgency challenges in the crises ridden area specifically, the states of Borno, Yobe, Gombe and Adamawa. The medical kits which include but not limited to health equipment such as delivery kits, interautrine devices and referral kits for reproductive health was meant to help the affected women and children in the crisis ridden Northeast. Medical Specialist with UNFPA, Doctor Audu Alayande explained that, considering the wanton destruction of health facilities in the crises ridden area, the portability of the kits donated will enable displaced users to have treatments similar to that of established hospitals. “This kits and equipment consist of supplies and commodities that is required by any human being to be able to access daily health service required. “Where people have been displaced and they don’t have access to their routine services and facilities because they have been destroyed, women and children who dont have access to basic services like antinatal, safe delivery can make use of these with little attention of health care worker needed”, he explained. 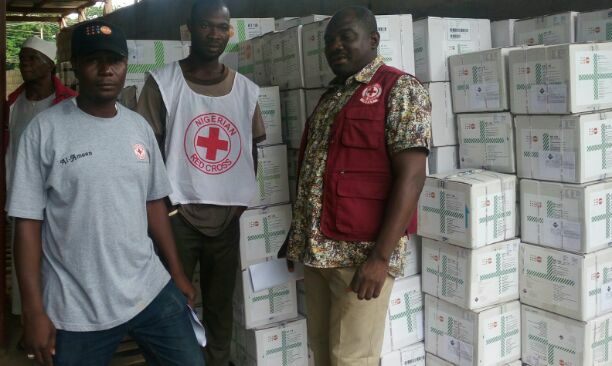 Recieving the items, Secretary of Nigerian Red Cross, Kaduna branch, Shehu Umar Abdul said, mechanism put in place to prevent possible diversion of the items is strong enough because the data of sharers, who are mostly volunteers have been captured.